It was quite possibly one of the biggest trends to come out of 2016 and I think we'll continue to see a lot more of this Danish word this year. There were books published on it, Instagram and Pinterest have been consumed by it and people across the country are making their lives more hyggelig. The American/British version of this is fairly similar; it's just drawing attention to the word or action instead of simply partaking in it. That said, there is not much out there that is nicer than hygge. When it comes to interiors, I personally am one for contrast. 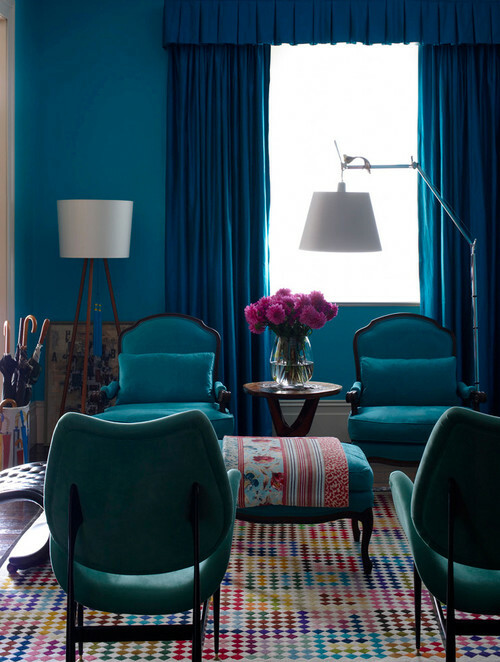 However, lately I've been noticing a rise in monochromatic rooms ranging from plain white to rich, jewel tones, and I have to say there is something soothing and luxurious about these spaces. Texture is important in monochromatic settings, often seen with rich velvets, soft linens and matte paints. But what I really like about them is the contrasts pulled from tones instead of colors, which is what lends them the soothing, cozy vibe. I have to confess: I love those chairs! You may disagree, since I've often heard people complain of the terracotta in a space and proclaim it needs to be replaced, but I for one have always been a fan and am officially predicting we will be seeing more of this. Why? Because it adds a lot of warmth to what has been a washed out white trend for a long time. Whether matte or polished, there is something about these tiles that immediately makes me feel like I'm in Spain. Meaning it adds warmth, charm and character. While I don't think that the faux painted yellow walls of the early 2000's will be coming back any time soon, I do think we will see these tiles used in a more modern way, with white or pale gray walls, which will be a cool contrast. Good news for your farmhouse table! It will look like it's right where it's supposed to be. I may be wrong, but I'm sensing that 2017 will be much, much softer than 2016. While velvet isn't for everyone - it's heavy and really changes the atmosphere of a space - small accent pieces of it, like a side chair, are about to enter our lives. And no one can deny that an object of velvety goodness isn't amazing to sit or lie on. It's almost as if an uncomfortable chair covered in velvet suddenly becomes cozy and nice. You could probably put velvet on my kitchen counters and I would lie on them. And it doesn't have to be a piece of furniture either! Just a pretty bolster pillow could be all the velevet you need. Plus, think of the colors. Blush pink like the curtains above, or the pale seafoam throw pillows we have in our den, are far more subtle and relaxing than bold colors, yet bold colors can be so much more fun! The abilities of 3-D printers and the digitalization of manufacturing, or the "3rd industrial revolution," offers homes a chance to up their elegance, sophistication and appeal, all while using sustainable sources, which is a big trend we will look into another day. These LED bookcases, for example, are a sample of how LED and glass can be incorporated to transform a room. Glass etching has never been easier either, and combined with LED lighting, it's as if the glass comes alive. The options are not only endless, but cost effective too, which means that this is something we will surely be seeing much more of in the not-so-distant-future. If you're interested in knowing how this technology will impact the housing market, according to realtormag.realtor.org, "The glass-and-LED combination is just one new technique that can result in a product that incorporates a sustainable material into a sturdy, practical, energy-efficient, and glamorous new surface for kitchen and bathroom countertops. Such choices greatly personalize rooms much more than another granite, laminate, or Corian top might do, and help to distinguish listings in a crowded market." What are your thoughts on this? Love it? Hate it? Let us know! We are always happy to read your comments on any of the topics we discuss. 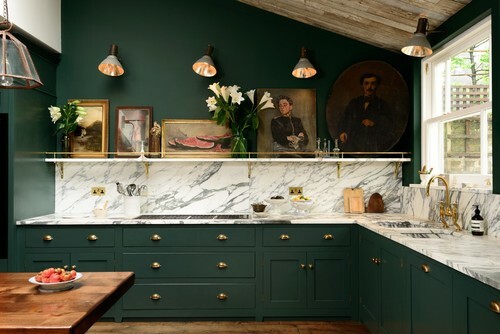 The latest trend we predict you will be seeing much more of is gorgeous emerald greens. Whether you are brave enough to paint your living room in a high gloss dark green or just looking for a pop of it to bring some earthiness to a space, this is a color you really can't go wrong with. It invokes a feeling of wealth while bringing us back to our roots of outdoor natural living. The color itself is velvety with richness. It's moody and elegant, touchable and soft, yet empowering and dominant. Expect more in 2017. Follow us on Pinterest at ​www.pinterest.com/waterfrontguide/ for more inspiration. It's not just in your bathroom anymore! Marbled everything is making a major comeback, from Carrera to frosting, duvets to wallpaper, the marbled look works well both in large scale and as small accent pieces. The tile patters range from herringbone to basket weave to large, solid tiles and counter tops. Historically a symbol of wealth, a favorite for sculptures, and a classic retro look in bathrooms (I remember the original olive green marbled resin sink as a child,) this look has made a come-back in more ways than one. Last week we looked at black details so continuing that theme is something we've been noticing more and more of lately: matte metals. We could go ahead and group another trend - black stainless appliances - in the same category because they're matte black. Easier to care for than regular stainless in that they aren't as susceptible to to smudging, the effect of the black is dramatic yet classy. Last year it seemed everything was shiny but 2016 has proven to be the opposite. Everything from fashion and makeup to lamps and appliances, matte is the newest sheen.